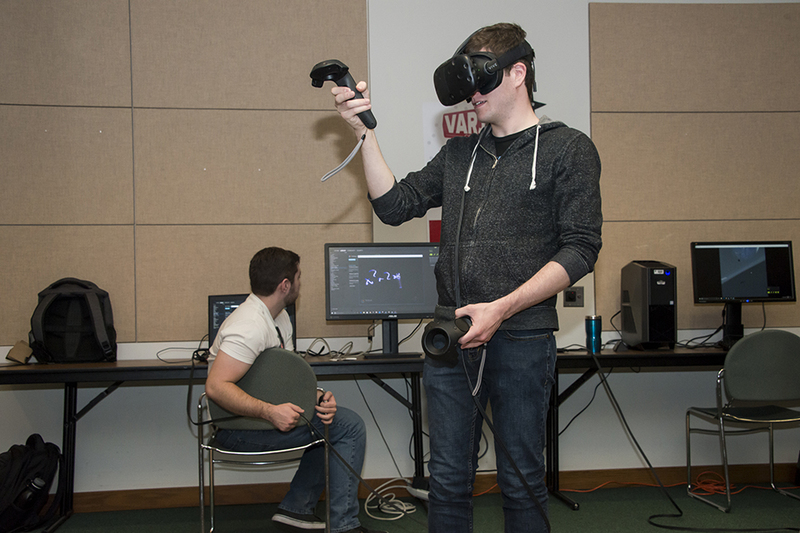 Will Goldstein, second-year electronic media management major, tests out the Google Tilt Brush Virtual Reality game streaming on a Steam VR system as multimedia student assistant, Jared Berman, monitors the game play. Photo by David J. Hawkins. 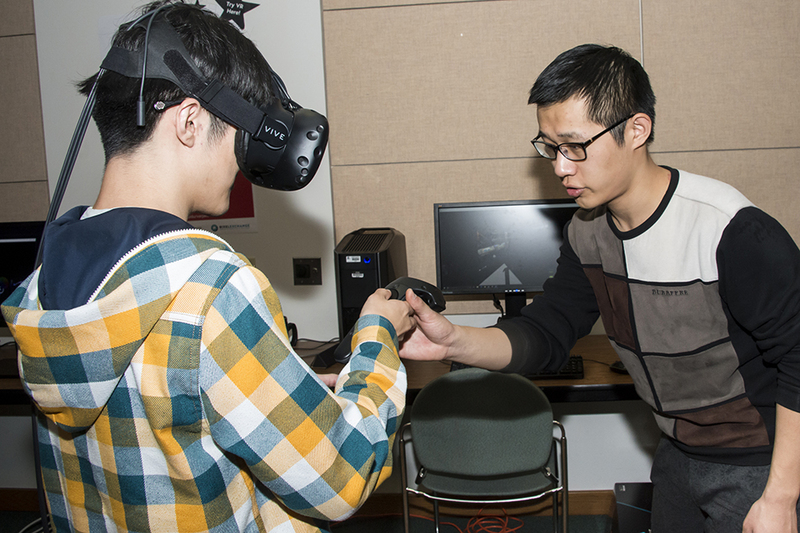 A faculty multimedia student assistant helps another student maneuver hand-held controls and navigate through the Google Tilt Brush Virtual Reality game. Photo by David J. Hawkins. California State University, Northridge launched its first virtual and augmented reality competition on March 3. Students, faculty and staff members gathered together in the Ferman Presentation Room of the Delmar T. Oviatt Library for the kickoff event of Visual and Augmented Reality Jam (VARJAM), a competition where prospective students from all majors across campus work in teams to develop projects focused on a variety of concepts, from education to entertainment, using the latest virtual reality (VR) and augmented reality (AR) technology. Los Angeles is one of the big players in VR and AR technology, which is predicted to become a $150 billion industry by 2020. VR takes the viewer out of the real world and places them into a virtual world, while AR overlays virtual information onto the real world, said Jacob Enfield, multimedia option head and leader of the VARJAM project. During the event, students learned about competition guidelines for submitting a two-minute multimedia presentation describing their project and how to gain access to the VARJAM Canvas site for resources or discussion boards. Students were also able to try out a small selection of VR and AR equipment firsthand. Will Goldstein, a second-year electronic media management major, tested out the Google Tilt Brush VR game at VARJAM. Students and attendees also had the opportunity to meet with sponsors from the LACI@CSUN and BixelExchange. One requirement for students interested in joining the VARJAM competition was to have one member of their team attend the kickoff event. Ed Beres, LACI director of university relations, said the winning team from VARJAM would have the opportunity to present their project to a panel of VR and AR experts and share their thoughts on the industry during an event on April 21 at the LACI headquarters in downtown Los Angeles. The VARJAM 2017 registration deadline for student teams was March 6 at 11:59 p.m. The next event will be on March 10, from 10 a.m. to 4 p.m. in the Extended Learning University Building. Faculty and students are encouraged to attend. Workshops will focus on training and teaching the basics of creating and editing photospheres, virtual reality, augmented reality and 360 videos as well as attend a presentation on the art of storytelling by White. Students may choose to attend any or all of the workshops to help them submit their strongest work.